Special occasions call for special meals. I’m not sure it works the same with a bag of chips or a delivery pizza (okay, maybe if it’s Papa John’s), but the physical elements of an event, not the least of which is the food we prepare and savor, play a huge part in impressing us with lasting, intangible memories. 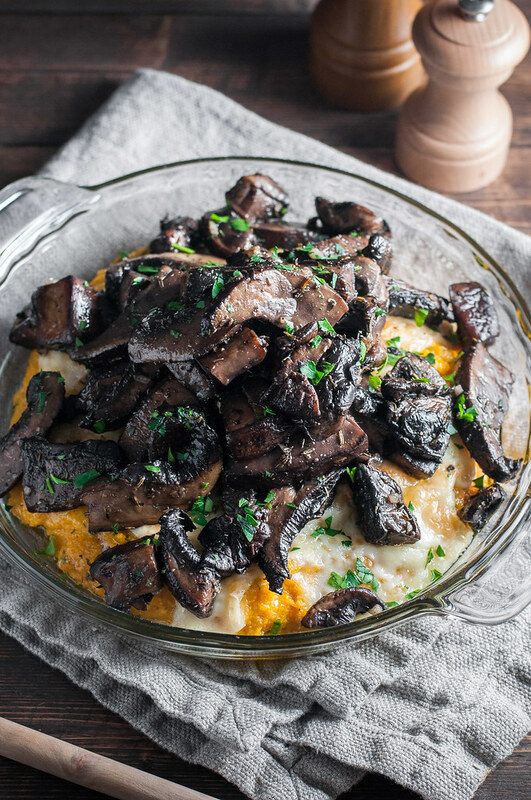 The sound of words spoken and snores on the couch, the touch of a hug or kiss or hand hold, the sight of our favorite PJ’s or the gaze into a loved one’s eyes, the smell of crisp winter air and sugar cookies, and the taste, oh the taste, of creamy mushroom polenta bubbling with melted, golden brie cheese. Each of those physical things help me remember the air of love and contentment and laughs and being a family with Steve on our very first Christmas together as a married couple. I worked hard to plan the perfect menu for two for that special night. As always, it turned out to be more work than I bargained for, and Steve happily abandoned his nap for the stimulating task of stirring polenta non-stop for 45 minutes. 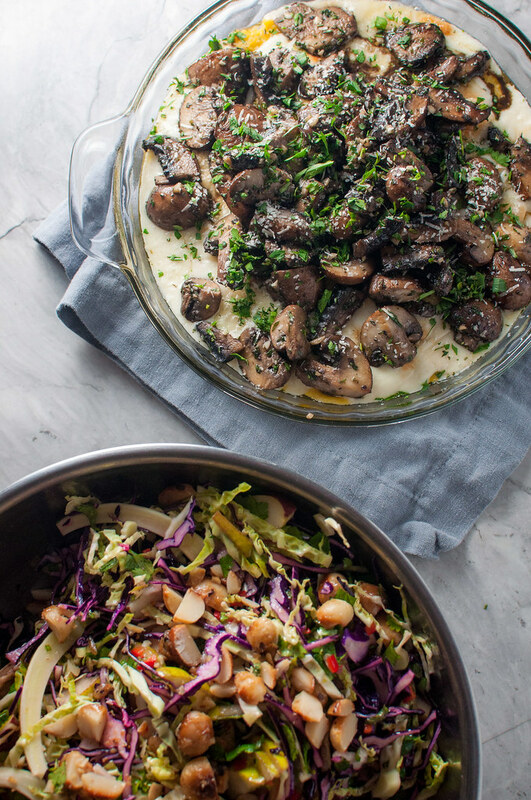 It was worth it, resulting in this beautiful spread of Ottolenghi’s much more labor and ingredient intensive mushroom polenta and a winter slaw with the best spicy candied macadamia nuts I have ever tasted. On top of it all, he suffered through a mini photo shoot to really etch that meal in our minds (and the internet) for eternity. 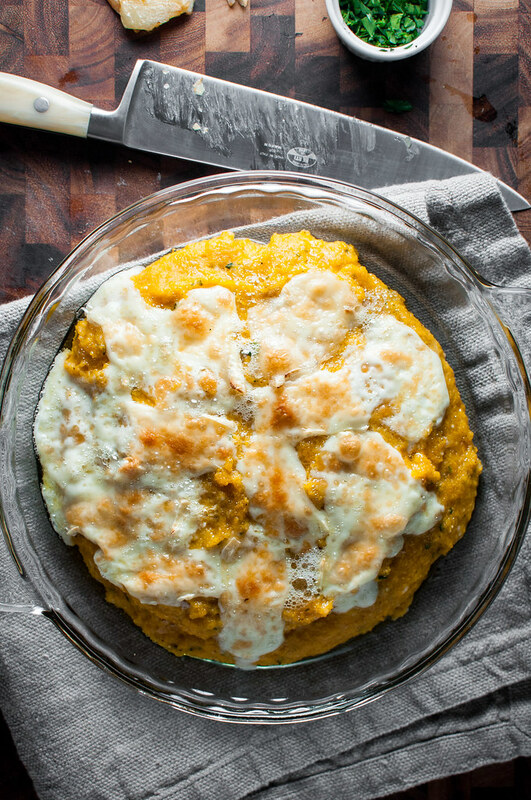 Despite the work, though, the polenta turned out to embody a one dish meal of love, which is why I knew I could revamp it, making it much quicker, and with more accessible ingredients, so that you can make your own memories over it for a weeknight dinner just as easily as for a third date or 439th date dinner. The secrets? 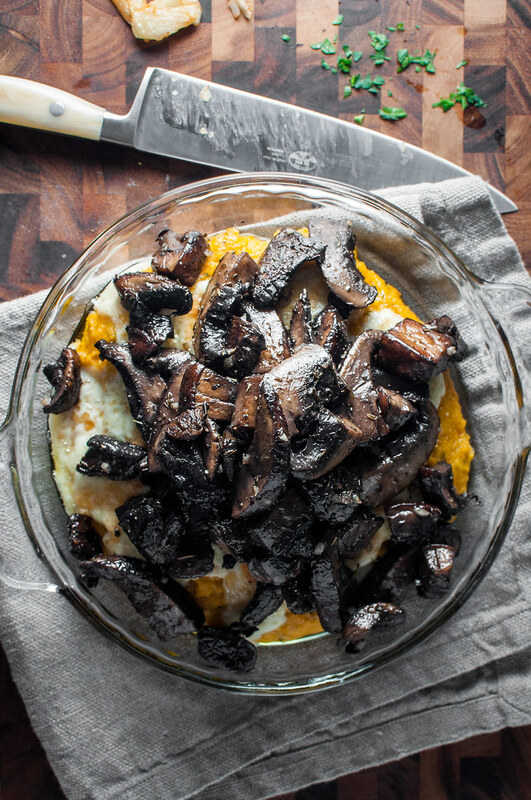 Track down some instant polenta, which is as quick to prepare as it sounds, melt brie (not Ottolenghi’s preferred expensive Taleggio) over that creamy polenta base, and top it all with some big chunks of pan browned basic mushrooms and an herb or two for even more layers of flavor. I tend to be an easy sell for new grocery products, but even I winced as the cashier swiped that teensy little $11 bottle of truffle oil at Whole Foods. But, if you’re looking for the cherry on top, note that it’s well worth the splurge, and that magical oil has a million other uses, including in your scrambled eggs at breakfast the next morning as you smile over freshly made memories. Gluten free/vegetarian. After making Ottolenghi's version of this special, rustic dish for my husband on our first married Christmas celebration, I couldn't resist making a few changes to the long ingredient list, keeping the dish special but reducing the cost and time involved so it's approachable for all. Heat olive oil over low medium heat in a large skillet. Add the crushed garlic and cook until cloves are golden brown, stirring occasionally. Remove from oil, reserve, and increase heat to medium high. Add mushrooms and toss to coat. 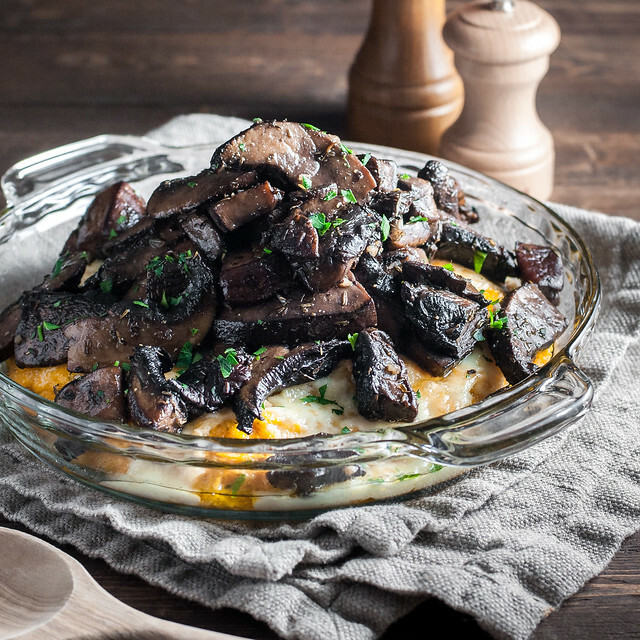 Stir infrequently until mushrooms start to release their liquid (they should brown a bit), then stir in thyme. Cook until liquid is nearly evaporated, then turn off heat. Add truffle oil or truffle salt, if using, then season to taste with additional salt and pepper. Mince 1 of the fried garlic cloves and mix back into the mushrooms. Bring stock to a boil in a medium saucepan. Whisk while pouring in dry polenta, then reduce heat to medium low so polenta is barely bubbling. Keep an oven mitt handy--it may splatter. Stir constantly until polenta is soft to the bite and pulling away from the sides of the pan, about 3 to 5 minutes. If polenta is much too thick, add some water a little at a time and heat. Off heat, stir in parmesan, butter, fresh herbs, and salt and pepper to taste. Preheat the broiler and move oven rack about 8 inches from heat. 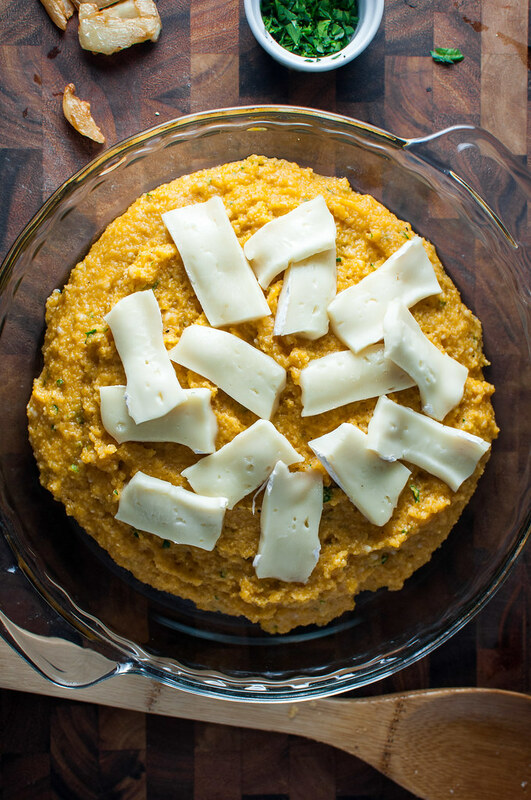 Oil or spray a broiler safe pie plate, then pour polenta into it, spreading it just slightly if it's become stiff. Arrange brie slices over the polenta, not quite to the edge. Broil until brie is bubbly and golden brown, about 4 minutes. Remove and top with mushroom mixture in a big pile--it should look rustic and imperfect. Broil again for a couple minutes to warm mushrooms. Garnish with leftover fresh herbs and black pepper, and serve hot in big scoops. The dish can also be kept warm, covered with foil, in a low oven for a couple hours. Depending on the season, you can use rosemary (cool weather), parsley (warm weather), or another herb of your choice, such as sage or tarragon. 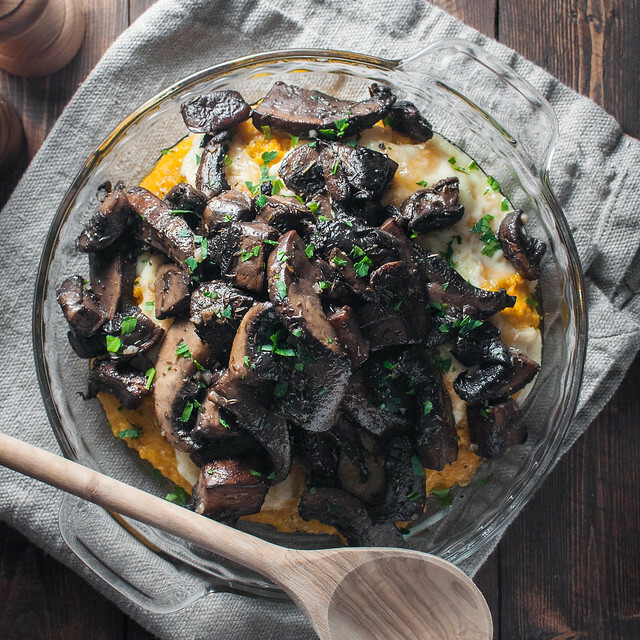 You can use traditional polenta, but unless you're cooking with a friend who loves to stir, I highly recommend instant for this particular dish. I used this brand which I ordered online, since grocery stores near me don't always carry instant polenta. Note: This page contains affiliate links. It does NOT contain sponsored content. 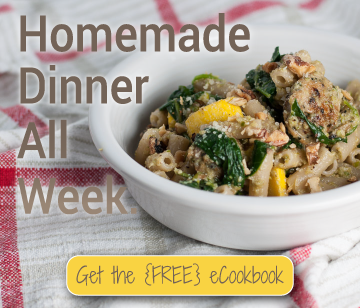 Affiliate links (to products I recommend, on Amazon) offset my ingredient and website maintenance costs, so I can keep bringing you rustic recipes like this one. Thanks!